Playing a Hypothetical Star Wars “Battle of Endor” on the Tabletop #SciFiSunday « Adafruit Industries – Makers, hackers, artists, designers and engineers! The fine-feathered gaming geeks at Beasts of War have outdone themselves again. This spring, we covered their amazing Battle of Hoth game and terrain board that they put together for Salute 2015, the annual UK gaming convention. 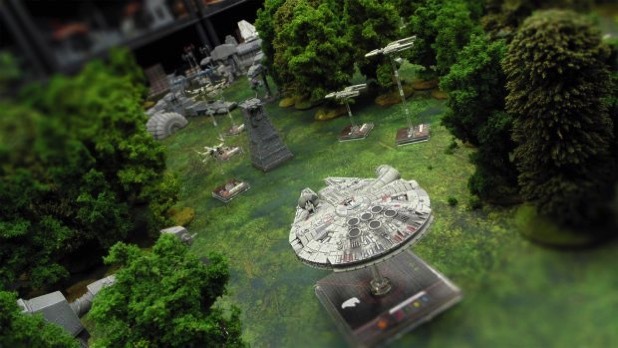 Here, inspired by the forthcoming Star Wars: Battlefront video game and scenes from the forthcoming Star Wars film, they challenged themselves to put together a new terrain board and special rules for the incredible Star Wars: X-Wing miniatures game, all within a day. The results are quite impressive.